Sentimentally Funny: Happy Birthday Together Forever! I was due on the 1st of April and came a day late, then two years later, Amy was due on the 3rd and came a day early. What are the odds? 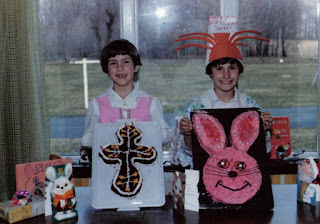 We spent our childhood years sitting next to each other at the table, with our respective cakes and matching presents. We opened our presents fast because we always knew we were getting the exact same thing – just in different colors. “No" I said, "But, we were born on the same day. I'm just two years older than her." He looked completely confused. Liars. Big fat liars! That’s what the waiter was thinking. We tried to explain how one of us came a day early and of one us came a day late, two years apart, but he wasn’t buying it, so no wine for Amy. We’ve managed to get together and celebrate our big day even when we were living 12 hours apart, simply because it feels too weird not to. We did not celebrate my 30th together because her daughter, my god-daughter, was due early in the month and I wanted to fly out for the baptism later in the month, so greater priorities prevailed that year. Today, my sis is coming for the day and we’re going to the salon to beautify ourselves. We are going to spend the day together because there’s nobody else we would rather spend it with than each other. We are eternal best friends and I thank God everyday my parents decided to have another baby even after putting up with me. What a lucky girl I am! Another amazing post...made me get teary eyed! What a special relationship the two of you have! Is it wrong for me to envy that? I have 2 sisters..but they are several years older than me and have never been very interested in me. Sad...but that's life. No major biggie! Anyway...congrats on getting to spend the day with your favorite birthday girl! Spinning is going great! I wish they had it available EVERY morning!